A 29-year-old machine operator from Frewsburg, NY, took down the 2015 Seneca Fall Poker Classic Main Event title at the Niagara Falls Poker Room in Western New York on Monday. Kurtis Boutelle earned $62,933 and Seneca Niagara poker glory by defeating a field of 291 entries and dominating play at the final table. After two Day 1 starting flights, 60 players returned to fight for seats at the final table on Sunday. The final nine was set just before 8 p.m. with Alex Visbisky leading, but Boutelle was only a few blinds back. Monday's final began just after 12 p.m. local time, and it wasn't long before short stack Tony Dojka ran a weak ace into Buck Ramsay's dominating one to bust ninth. Alfred "Uncle Karma" Stempien then took eighth when he ran the into Boutelle's queens, and Ramsay took seventh running tens into Visbisky's kings. Ryan Rivers lost a battle of the blinds with Boutelle to bow out sixth and although Visbisky had the lead, he bluffed that off into a Silvio DeRubeis straight as play moved forward. DeRuebis was the next to go, however, downed by a huge cooler when he called a four-bet shove with the versus Boutelle's . At that point, Boutelle had about half the chips in play, but he gave heaps back in a massive hand calling both a David Battaglia shove and Nathan Torrance re-shove with the . Battaglia had the and Torrance the with Torrance making a set on the river to scoop, send Battaglia home fourth, and bring Boutelle back down to Earth. Though it wouldn't be long before Boutelle would rise again. After a little back and forth, Visbisky got it in with eights versus Boutelle's kings preflop, whiffing to take third and send Boutelle into heads-up play holding a big lead over Torrance. Torrance gave it a go with some relentless aggression, but when Boutelle started playing back at him, he was soon overwhelmed, finding a chop once after getting it in dominated, but bowing out second when called all in with ten-high and did not connect against Boutelle's ace-high. Boutelle had the big hands in all the big pots from Sunday morning through until the 2015 Seneca Fall Poker Classic title was his, and now etches his name in the annals of Seneca Niagara poker history with a dominating win. That's all for now from the Niagara Falls Poker Room at the Seneca Niagara Resort & Casino, but look for PokerNews to be back in Western New York area this Spring for the 2016 Western New York Poker Challenge. PokerNews Podcast Episode #344: Is Pennsylvania On the Verge of Getting Online Poker? Rich Ryan and Donnie Peters discussed the big winners from the 2015 WSOP Main Event on last week's podcast, but neglected to mention the biggest winner, the U.S. Government. They break down some of the massive tax payments the IRS will receive from the November Niners, and discuss the online gaming bill moving swiftly through the Pennsylvania State Legislature. Don't forget, you can call the show and leave a voicemail at 774-77-PNPOD. Nathan Torrance made it 150,000 and Kurtis Boutelle pushed in. Torrance made the call for his tournament life with the and Boutelle was ahead with the . 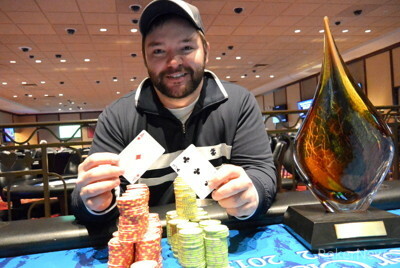 The board made Boutelle a pair and as Torrance headed to the cage to collect second-place money, Boutelle became the 2015 Seneca Fall Poker Classic Main Event champion. Kurtis Boutelle is back in dominating position after a big river shove. There really wasn't much action on a board until Nathan Torrance led for 400,000 into a 600,000-chip pot. Boutelle then shoved all in to force a fold. 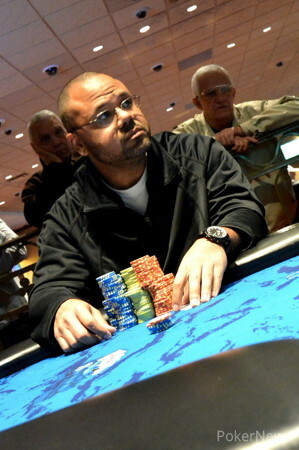 A hand later they got it in with Boutelle shoving the over a 150,000-chip open from Torrance. Torrance called holding the . They chopped on an board. Kurtis Boutelle pushed Nathan Torrance of a 500,000-chip pot with an all-in river bet. Boutelle also pushed in from the button the very next hand, getting a fold. But when he did it a third time after Torrance limped the button, Torrance called. It was Boutelle's versus Torrance's for all the marbles and Torrance doubled on a board to get back in it. Kurtis Boutelle has stepped up the aggression, now coming over the top of Nathan Torrance's relentless raises with more frequency. As a result, he has extended the lead heading into Level 28. Stack sizes continue to stay the same and there hasn't been a turn card in what seems like ages. Nathan Torrance is the aggressor here, raising all his buttons and every time Kurtis Boulette limps his. There's a pattern developing as Torrance picks up small pot after pot until Boulette makes a stand and plays back at him in the larger ones, bringing things back to even. Stacks remain about the same, with Nathan Torrance picking up a few pots showing some early aggression before giving it all back moments ago. Boutelle limped the button and Torrance made it 150,000. Boutelle called and Torrance led the flop for 250,000. Boutelle counted out a call, then announced all in. Torrance folded. The 2015 Seneca Fall Poker Classic Main Event Final Table Starts Now! Day 2 of the 2015 Seneca Fall Poker Classic Main Event Starts Now!